Garam Masala is often used in Indian cooking. It's a blend of several Indian spices like cumin, cinnamon and turmeric. It takes a little time but it's so worth it. The result is so much more fragrant than the store-bought jars. It is used in a variety of Indian dishes, such as Tandoori chicken, palak paneer, dahls (lentils) and my Tandoori glazed roasted white seabass. Masala in Urdu means "paste" and garam means "hot", and oh boy, believe me, it's full of spices! The idea of a gluten-free chocolate cupcake came up during a dinner with friends. Laura's husband has a gluten allergy and was telling me the challenges she faces. I found out that she often uses chickpea flour as a replacement for all-purpose flour. Chickpea flour is common in savory dishes in Indian cuisine and is the main ingredient in paratha, a flat Indian bread. I was concerned that its heavy, grainy flavor would be too prominent and overwhelming for a dessert. I added a wide variety of flavorings like fresh ginger, cinnamon, rum, Medjool dates and of course chocolate to cover this up. The result was a dense chocolaty cake that has the internal consistency of fudge. 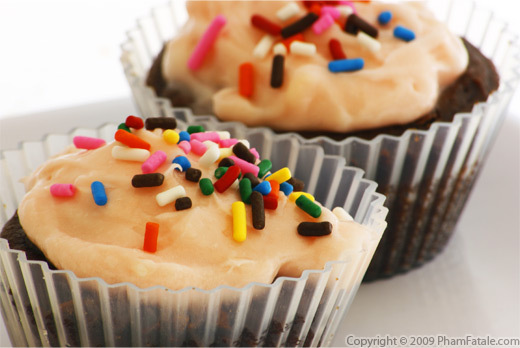 The addition of cherry cream frosting is a nice complement to the fudgy cupcake and adds a bit of moisture to cover up any remaining grainy texture of the chickpea flour in the cupcake. There are many sweet and sour flavor combinations in Asian cuisine, but I've gotten bored with the traditional hoisin plum sauce. For this preparation I added agave as the sweet element in the dish. I've been experimenting with agave nectar that I got on my last trip to Florida. Agave has a complex flavor that is sort of a cross between honey and caramel, but milder. 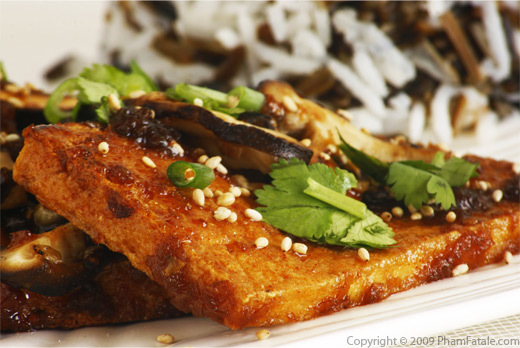 Tofu absorbs any flavor it comes in contact with and is perfect for the agave sauce. The dish is finished with some toasted sesame seeds for added crunch. OK, raise your hand if you are a chocolate lover. I am . Seriously, who does not love chocolate? Valentine's day is on its way and you guys know the saying "The way to a man's heart is through his stomach!" Here's a suggestion for a nice dessert. Wouldn't it be romantic feeding each other ginger chocolate mousse? 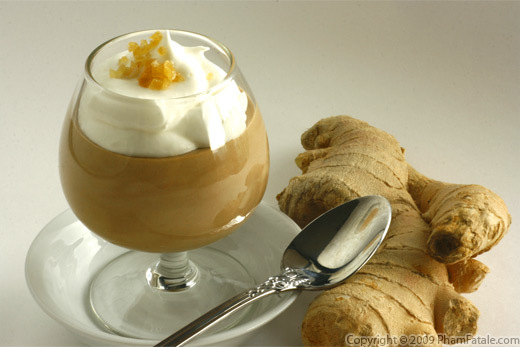 Ginger is natural libido enhancer, so go for it! Well, my hubby loves this decadent dessert. 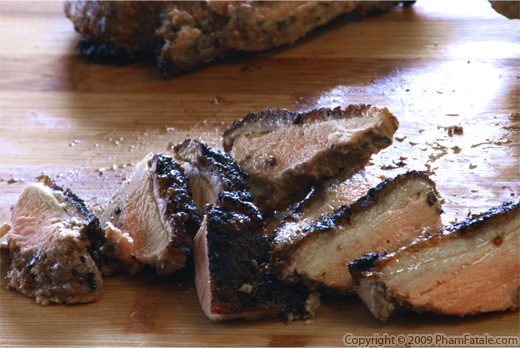 I'll be posting several recipe suggestions for Saint Valentine's day until February 14th.